Agritechnica, the world’s biggest exhibition of farm machinery covers a staggering 27 halls over 40ha and encompasses the whole spectrum of agricultural kit including spare parts, electronics, science, etc. This year’s show is just around the corner and the doors open on November 10th for the preview days. Hall 14, Stand E20 is where all the action is at the 2013 Show and so, if you are visiting Hannover then please find the time to come and see AMAZONE where a warm welcome awaits. Visitors to the Amazone stand will have the opportunity to see numerous innovations from the worlds of soil tillage, plant protection, fertilising and drilling. The highlight in the area of soil tillage will be the new Cayron 200 plough – back in the plough market after just 150 years of experience, AMAZONE will re-enter the inversion soil tillage market with a medium sized plough, initially in 5 and 6 furrows and suitable for tractors of up to 240 HP. Two versions will be available - the Cayron 200, with a stepped furrow width adjustable or the Cayron 200 V which is equipped, as standard, with hydraulic furrow width adjustment. And on the Cayron 200 V, the hydraulic adjustment of the front furrow width comes as standard as well. A simple hydraulic system provides a simple set-up of the front furrow width, the pulling angle and working width via three interlinked hydraulic rams. The plough on the stand at Agritechnica 2013 will feature a plough body that has been 100 % developed by AMAZONE. One of the characteristics of the C-Blade generation body is the front shin which has been enlarged by 90 %. With increasing ploughing speeds, the wear point is shifted down the mouldboard and this new shin design in front of the mouldboard entirely covers the wear area thus reducing the running costs. In addition, one other detail makes a huge effect. The wing is designed in such a way that the point covers the wing. The welded seam is located safely under the point, thus hampering objects, such as, for example, baler twine from becoming trapped in the welded seams between the wing and point. During the turning procedure for the Cayron 200 V, initially the plough frame is swivelled out to achieve sufficient ground clearance under all conditions. The position of the plough body to the frame remains unchanged. There is no movement in the individual body bearings but just in the strong vertical bearings of the main linkage system. Continuing on with the soil tillage theme on the Stand will be the new Cenius TX mulch cultivator; available in working widths of 6 & 7m, the Cenius TX is aimed at tractors in excess of 300 HP and offers a plethora of permutations when it comes to depth control. The machine can be carried on the front support wheels and rear consolidating roller or a mixture of the those plus the mid-mounted transport wheels in very light land conditions. In the wet, the rear roller can be dropped off and the soil surface left open against capping. In hilly terrain, the traction control system can be activated to add up to 1500 kg more weight from the cultivator onto the rear axle of the tractor to aid traction. The TX can be used for stubble cultivating at a depth of around 8cm, or 12-18cm for secondary soil tillage down to top soil deep loosening depending on the share equipment attached to the new C-Mix tines. The pressure spring breakaway system has a stone protection system that releases in excess of 600kg and gives a tine clearance of 30cm. The interchangeable share system can be equipped with the 350mm wing shares, the 100 mm inversion shares or the 80mm deep work shares. Working depth is down to a massive 30cm and tine spacing is at 28cm row to row and 75cm from point to point. The 80cm high frame ensures that the boil effect created by the four rows of tines can work its way through the machine blockage-free. The Pantera has now been very well accepted in crop spraying circles and, building on this excellent reputation, the new Pantera 4502 will now offer greater engine power, greater tank sizes, faster travelling speeds and more efficiency. The tank size is now a nominal 4500 litres, with the ability to take 4800 litres of liquid fertiliser. 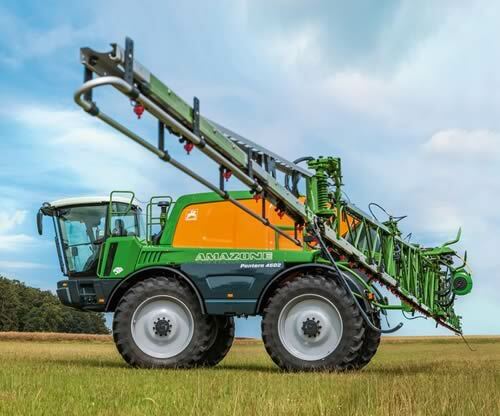 The drive unit is new from the ground up with three new chassis variations: Standard – High clear – Wide track (for all spraying applications from maize to potatoes through to cereals.) The hydrostatic drive system receives more torque, bigger wheels and disc braking giving it the ability, in theory, to travel at up to 50 km/h on the road where it is legally possible. The 218 hp Deutz 6-cylinder engine now meets the Tier 3B emissions standards with an exhaust gas recirculation system and self-regenerating DPF. The unique engine management system and traction control set-up remains from the Pantera 4001. The communication system is now ISOBUS with a choice of AMATRON 3 or AMAPAD controllers looking after the spray pack. The AMADRIVE touch screen continues to look after the vehicle functions as well as controlling the spray pump drive level. Altec pumps are used now across the range. The Cirrus range of trailed cultivator drills has always played a major part in the Amazone drill line up. The new Cirrus 03 series builds on those strong credentials and expands the range of operation, with a new highly manoeuvrable shortened Cirrus 3003 Compact as the entry level model, right up to the grain and fertiliser 6003-2C model. The heart of the machine revolves literally around the new Matrix tyres which, with their radial construction and large diameter, make for an easy pull of the machine and also an excellent self-cleaning effect. In true Amazone style, the Matrix tyre offer strip-wise consolidation so, depending on row spacing either 3 or 4 of the new RoTeC pro disc coulters follow the strip of soil most heavily consolidated by the ribs on the tyres for optimum seed/soil contact. The RoTeC pro coulter gives an enhanced seed placement due to its new furrow former and seed pipe entry design. Hopper sizes are increased now up to maximum of 4000 litres. The ZA-TS and ZG-TS new generation fertiliser spreaders will be there in force plus the 1,000,000th spreader ever made by AMAZONE – not many other spreader manufacturers can claim such a feat. Come and see a view of the future as the new ZG-TS Automatic will feature on the Stand - the name Automatic means just that in every department. With this our 130th year of company history, there is also a multitude of electronic innovations from GPS-Switch on maize drills and seed drills through to the new SwitchPoint software for spreaders as well as the new documentation systems – there is plenty of reasons to come and have an hour or two on the stand.